Grandchester Railway Station, a short drive from Ipswich, is the jewel in the crown of the charming township of Grandchester. The beautifully restored station, under the banner of the National Trust of Australia, is open to the public on the first Sunday of each month when dedicated volunteers conduct tours for visitors. The Grandchester Model Steam Railway rides occur on the same day, so make a day of it for the whole family! Originally known as Bigge’s Camp, Grandchester was the western terminus for the first railway in Queensland, and the first section of the main line to Toowoomba which set off from Ipswich in 1865. Visiting the station, you are privy to equipment and machinery from the past and can see the unusual square water tank, stationmaster’s house (built 1910) and signal cabin. 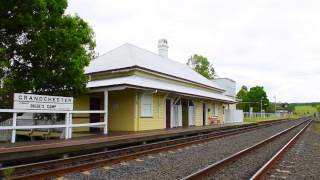 There’s a truly old-world charm to Grandchester Railway Station and its picturesque rural surroundings in the Lockyer Valley, making it a perfect day trip destination if you’re in the Ipswich area.